This series of Samsung TV’s has both capacitor issues and tcon failures. Bad capacitors will cause the TV to not turn on or turn on with difficulties or have pink dots on the screen. Tcon failures caused by a failed AS15F gamma reference IC will cause colour problems or a whitewashed image. Capacitor values for these two models are as follows. 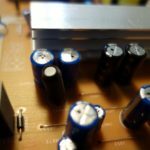 Capacitors need to be low ESR. Panasonic FC, FM or FR series or Rubycon PX series are good replacements. To check your tcon board, there should be test points for the gamma reference points. The voltages should increase or decrease steadily with no big jumps or outliers.